Over 200 high-level policymakers, researchers and practitioners will gather in Stockholm on May 7–9 for the fifth annual Stockholm Forum on Peace and Development. Co-hosted by SIPRI and the Swedish Ministry for Foreign Affairs, the 2018 Forum focuses on the politics of peace and seeks to identify concrete steps towards sustainable peace. On 28 March, SIPRI convened a panel of experts to discuss the fate of the Iran nuclear deal in light of US President Donald J. Trump’s ultimatum to withdraw the United States from the agreement. The focus of the expert seminar was on whether Europe can prevent the deal from unravelling. SIPRI, together with Hiroshima Prefecture and the United Nations Institute for Disarmament Research (UNIDIR), hosted a side event, ‘Identifying concrete steps to move forward nuclear disarmament’, at the 2018 Preparatory Committee for the 2020 Nuclear Non-Proliferation Treaty Review Conference. SIPRI is committed to following the European Union’s General Data Protection Regulation (GDPR). We would like to invite you to update what you would like to receive from SIPRI at your personal link at the bottom of this newsletter. You may also choose to completely unsubscribe from receiving any of our electronic mailings. 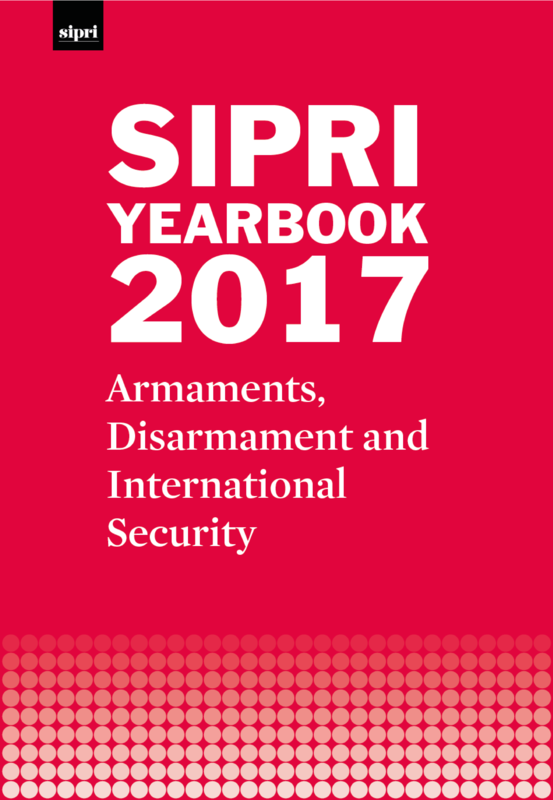 We sincerely appreciate your interest in SIPRI’s work. Dr Tarja Cronberg, SIPRI Associate Fellow and the author of Nuclear Multilateralism and Iran: Inside EU Negotiations has revisited Tehran to meet with Iranian high-level officials and the EU, Chinese and Russian ambassadors to Tehran. Her ‘Tehran interviews’ form the background for this blog at this critical juncture for the Iran nuclear deal. Early this month, the United States, the United Kingdom and France launched strikes which targeted Syrian chemical weapons sites. Reflecting on these developments, Dan Smith argues that striking before the Organisation for the Prohibition of Chemical Weapons (OPCW) conducted its investigation damaged diplomacy. SIPRI will partner with the Stimson Center for the US launch of SIPRI’s latest data on arms transfers and military expenditure. The event, ‘Dealing in Defense: Examining Trends in Global Arms Sales and World Military Expenditure’, will be held in Washington, DC, and will be livestreamed. 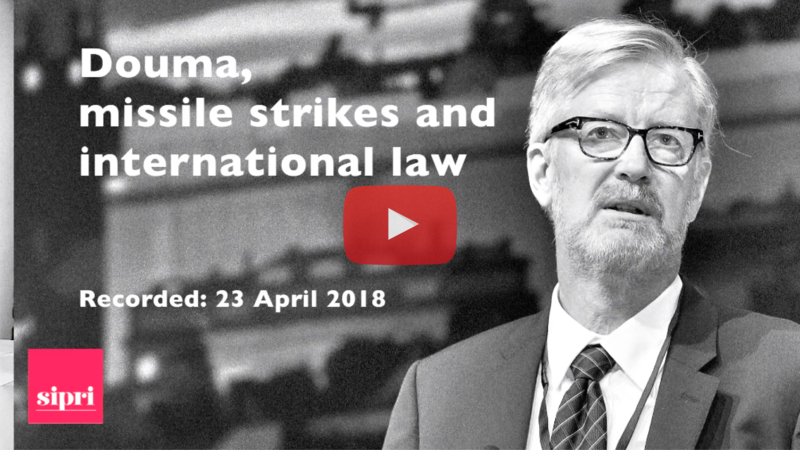 On 28 May, SIPRI will hold the inaugural ‘SIPRI Lecture’—a new annual high-level lecture in Stockholm on topics related to peace and security. Initiated by SIPRI Chair, Ambassador Jan Eliasson, the lecture will host HE Dr Hans Blix to share his reflections on issues in today’s world that pertain to SIPRI’s mandate of contributing to an understanding of the conditions for peaceful solutions of international conflicts and for a stable peace. The lecture will be followed by a distinguished panel discussion. More information is forthcoming. This event focused on UN peacekeeping reform in the context of gender mainstreaming, the safety and security of peacekeepers and the UN’s peacekeeping budget. The seminar, which was co-organized by the Embassy of the Republic of Indonesia—the Embassy of Ethiopia, the Embassy of Brazil and SIPRI—brought together experts from the hosts’ respective countries and Sweden. In this volume, six experts from industry, government, academia and the legal sector delve deeper into several key target areas of cybersecurity and critical infrastructure—namely system integrity, the role of the private sector and legal frameworks. Their essays provide a baseline for understanding how these issues are unfolding at the national level in Japan, at the regional level in Europe and at the international level under the United Nations. The paper examines (a) the different ways in which transfers of software and technology occur; (b) the proliferation-related challenges they generate, (c) the way controls are structured in the multilateral export control regimes and implemented in EU member states, and (d) the particular challenges that implementation and compliance present for EU governments, companies and research institutes. The conclusions highlight steps that different stakeholders can take to improve the consistency and effectiveness of software and technology controls. The paper reviews (a) the state of the art in additive manufacturing (AM); (b) its ability to produce military equipment and dual-use items; (c) the application of export controls to AM and their implementation at the national level; and (d) the challenges that implementation and compliance present for governments, companies and research institutes. The conclusions summarize potential options and considerations when expanding controls on AM. This SIPRI working paper identifies 10 practical steps to revitalize the 1968 Non-Proliferation Treaty as the principal normative and legal foundation of the global nuclear disarmament and non-proliferation regime. The working paper sets the stage for future concrete steps and initiatives to reduce the role of nuclear weapons and to eventually eliminate them. Funding for the working paper was provided by Hiroshima Prefecture.